Math Review basic math for microeconomics, R. Larry Reynolds of Boise State. Economics Test Review Notes are concise. Introduction to Economics 324 page textbook. Cyber Economics online text, Dr. S, Saint Joseph College. 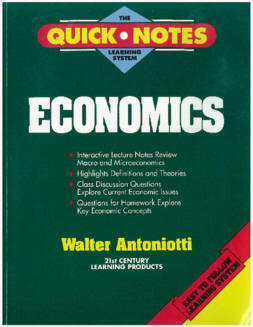 has books for economics majors and professionals. High School Economics Topics, Common NCEE requirements for high school classes. Current Events Internet Library has up-to-date economics news. The Daily Show With Jon Stewart - Videos have a little economics and are fun. Financial Times for today's economic stories. The Dismal Scientist is good for current events and more. Economics Articles from Professor Martha Stuffler of Irvine Valley College . Econbrowser is an economics blog. Center for the Study of Economics has studied about everything in economics. The Conference Board economics section predicts economic activity. Data Links from Econ Ed Links has current economic indicators and more. Economic Time Series from Economagic.com has economic time series data. Statistical Abstract of the United States contains a collection of statistics on social and economic conditions in the United States. Bureau of Labor Statistics Home Page has a broad field of economics and statistics. haywardecon.com is extensive free information. Teaching AP Economics often has daily review questions. class stagnation, politics and capitalism.